This is just another addition to my vast inventory of exotic wood accessories for Him & Her. 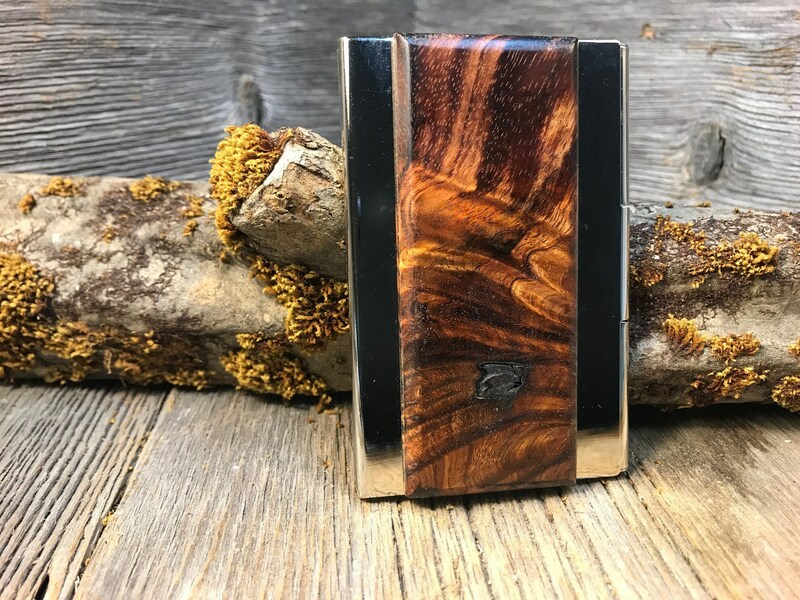 This simple and unique Credit card/ Business card case features a gorgeous cut of Gallery grade AAAAA Hawaiian Curly Koa crotch , precisely inlayed onto a chromed steel case. 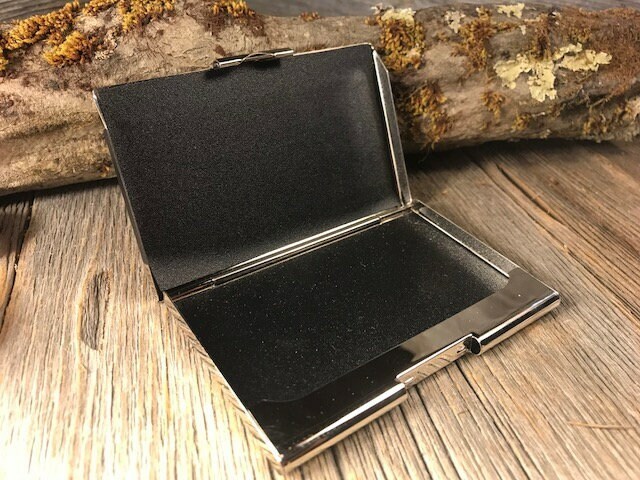 The interior is fully lined and keeps your business cards and credit cards perfectly organized and protected. 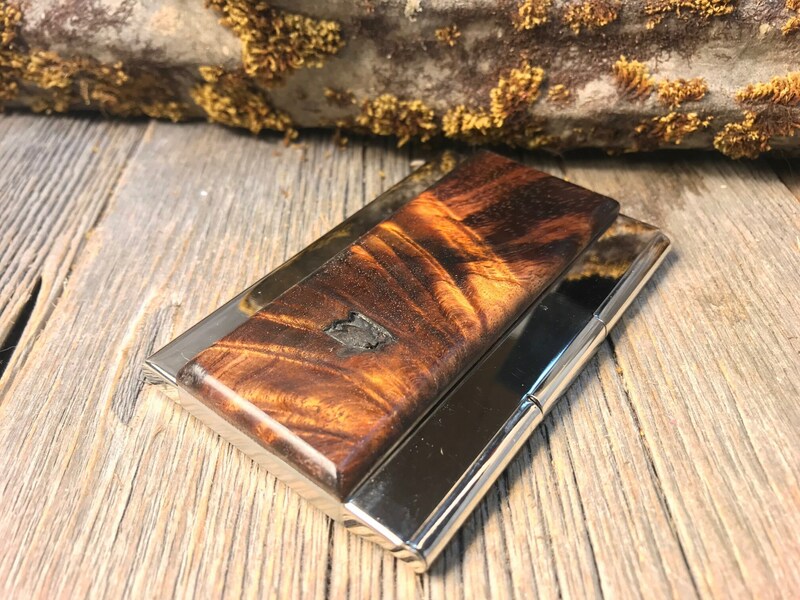 The hand-shaped blank is cut from solid stock rather than a thin veneer, widely found on Etsy, and is meticulously sanded and finished with oil and wax. 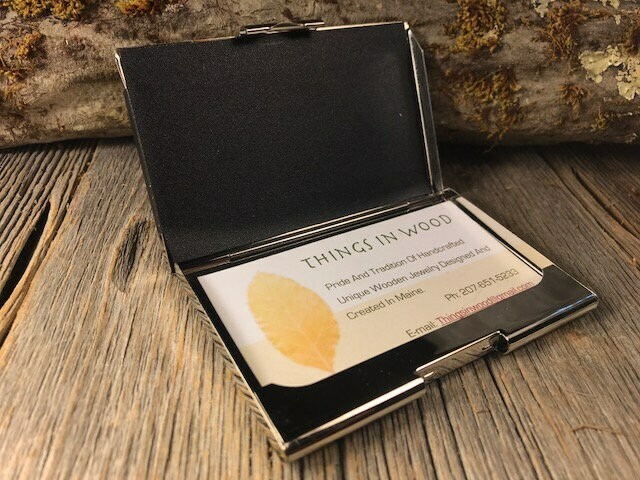 -	Each piece is then individually buffed for a finish-like warm satin glow, resulting in a completed piece without a surface finish that could crack, peel or flake off. The wood may contain naturally occuring cracks and voids, that define the caracter of the wood versus a piece of plastic. Every case is unique in texture and grain, and boasts a beauty that only natural wood can achieve. I pride myself of having the most superior selection of exotic woods and fascinating burls on the internet, as you can see in my other wears. 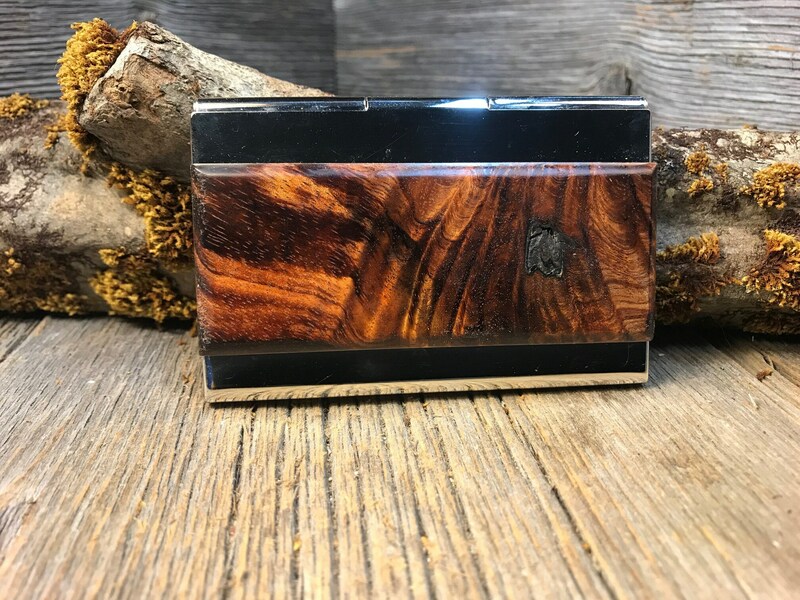 I pride myself to have the best selection in exotic and domestic woods on the internet, please check myother items to see the woods. 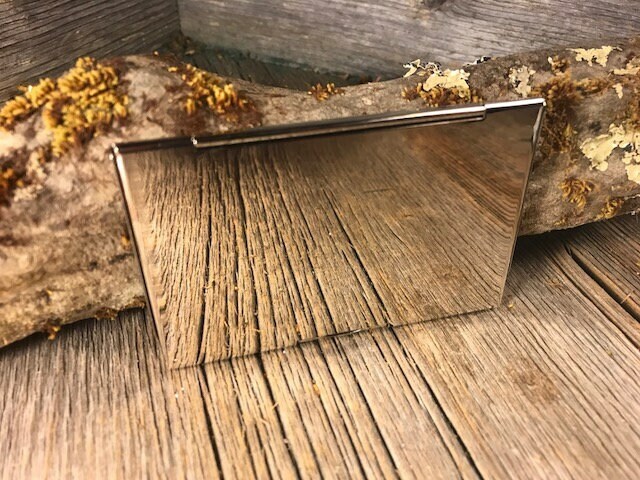 A full assortment of Money Clips, Cufflinks, Tie Clips, Tie Pins, Pendants, and even Keychains; all crafted for the discerning connoisseur of fine hand-crafted fashion accessories. 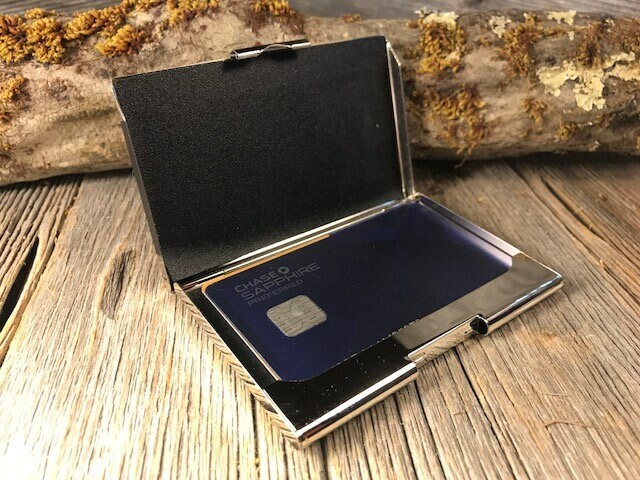 This case itself is made from top quality Chromed Steel, and has a lined interior and can easily hold 5 creditcards. Contact me for a complete list of 44 Wood Types and counting, as well as samples for custom work.